Air Niugini’s Fokker 70 jet aircraft, P2 ANR is now serviceable and back in operation following the successful completion of the inhouse C check, or heavy maintenance check, at the airline’s engineering hangar in Port Moresby. P2 ANR is the first ever Fokker 70 aircraft to have had a C check done in house, commencing in July this year. An assessment flight was successfully carried out on Monday 05th November and the aircraft is now back into service. 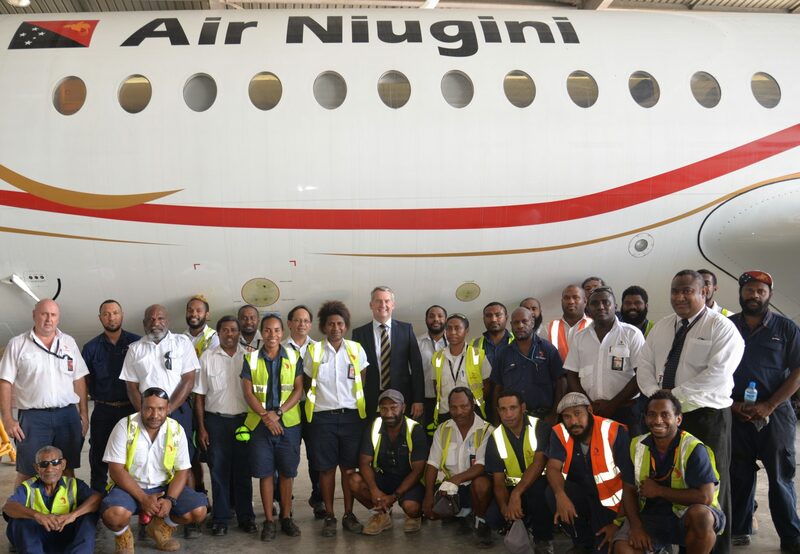 Air Niugini’s newly appointed Managing Director, Mr Alan Milne acknowledged the engineering team and all staff involved for an excellent job carried out in-house, saving the airline millions of kina. Mr Milne, who worked for Qantas in Australia for many years commencing as an apprentice aircraft maintenance engineer, said such an achievement demonstrates how much aviation has grown in Papua New Guinea, adding that the team delivered a remarkable project just in time for ANG’s 45th anniversary. Apart from P2 ANR, another two aircraft are being worked on at the moment, Fokker 70, P2-ANS and a F100, P2-ANJ. The engineering team is working on both aircraft in parallel to each other to again achieve the same results. Previously, the aircraft had to be sent overseas for such maintenance, which is very expensive for Air Niugini and the country. Air Niugini’s Licensed Aircraft Maintenance Engineer (LAME) in charge of Heavy Maintenance, Richard Woolcock, said it was through great team work that ensured they pulled together to ensure a great outcome for the airline. A ‘C’ Check is the most in depth type of maintenance that can be carried out on an aircraft. Basically, engineers take off every part fitted to the aircraft, inspect both the removed parts and the aircraft for damage, wear , corrosion and general condition then either repair them in house or replace them with new parts. When the aircraft leaves the hangar at the end of its check, engineers ensure it is as near to “As New” as possible, so that the aircraft can keep flying and passenger safety is assured.